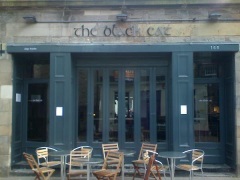 The Black Cat, Edinburgh, EH2 4BA. The Black Cat pub review, map and rating. Looking for a Hotel near The Black Cat? Nice bar, Black isle beer on tap, at the time it was the porter, delicious, Thistly cross cider(be warned 7.2 percent alcohol) from Dunbar. Best cider I ve ever tasted(I m biased I m Scottish) Deffo well worth a visit, I ll be back. By chance we came to this nice little pub searching for a good location with live music. Here at "The black Cat" we found very good handmade folk music (one of the musicians we recognized as the very friendly and helpful porter from Harvey Nichols), a great atmosphere among all the guests - no matter what age- and delicious beer on tap! The evening was perfect! Thank you very much: keep going! The Black cat is an independent public house run by the business owner Chris and his wife suzanna on Edinburghs' Rose street. They opened it in march 2011 having been in the industry for many years. My husband and i were visiting Scotland for the first time from Canada and were very happy that we discovered this place, popped in to see the live folk music. The atmosphere was fantastic and the welcome warm. Their passion for whisky was clear to see! I have never really drunk scotch but the barman made me something with sugar and bitters and it was very nice and something i will try to re create at home. The Black Cat's an Independent public house that opened early March 2011. Hours are between 10.30 am and 1 am each day. Landlord and most of the time only staff member Chris plus his young wife Susannah have created something for all ages of customers in the busy Rose St which is parallel to the now-boring Princess Street shopping are of central Edinburgh. Plus you get a cherry greeting. His punishing 14/15 hour day and night provides an airy bar, with corners to lose yourself and large mirrors so you can see every angle of your loved one. The “Scottish Fayre” snack food's not bad either...and economically-priced for the city centre. And in a capital city – a bottle of house wine for £6 – just right for poor people from Yorkshire. Warmly suggested: all staff members are very kind, the atmosphere is relaxing, food and drinks are very good and low prices: no weak points at all. In our four days holiday, every night we had our... mandatory visit at the Black Cat. The Black Cat opened in March of 2011. It's a friendly place with good choice selection of ales, beers, wines and whisky. Open till 1am and serving food till 11pm. It's one of my locals and I have had the Stovies, which I can highly recommend. The food is priced fairly and served quickly. Definite thumbs up for this place.